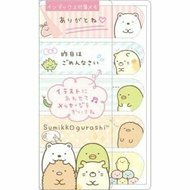 Sumikkogurashi index sticky notes. Perfect for marking the pages of your diary, notebooks or magazines. There are 5 designs x 15 sheets.